The Pro-Comp "Silver" series gauges feature bold black numbers on a silver dial face with a bright orange needle. They look great paired with Auto Meter Ultra-Lite gauges. 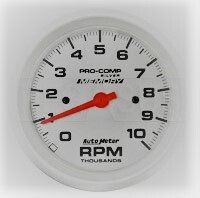 This pedestal-mount 3 3/4 inch diameter tachometer reads to 10,000 RPM and has an electronic "telltale" memory to recall peak RPMs. 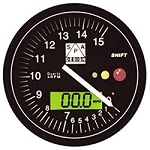 The telltale function is accessible by a remote rotary switch, so the tach does not need to be in the driver's reach. Rubber isolated mounting bracket adjusts for different mounting angles. The water-resistant case allows mounting outside the cockpit. 323 points will be rewarded to you when you buy this item.